Ill Bell is the dominant fell in the steep sided ridge that separates the Troutbeck and Kentmere valleys, and is part of the long eastern ridge that gives Troutbeck much of its character. From the Troutbeck valley Ill Bell appears to be part of a long smooth ridge, and the borders with the neighbouring fells of Yoke and Froswick are somewhat unclear. From the Kentmere side Ill Bell appears as a massive craggy pyramid, with a rocky eastern ridge that looms over the Kentmere Reservoir. The summit sits at the top of this eastern ridge, slightly to the east of the main ridge line. Two large coves - Over Cove in the north and Rainsborrow Cove in the south - sit on either side of the summit. The view from Ill Bell isn't entirely balanced. There is an impressive view of Windermere, and a good view west towards the central fells. To the north the bulk of High Street dominates, while to the east the fells on the far side of Kentmere block any views further east. There are also super views down into the neighbouring valleys, with Kentmere Reservoir seen from a viewpoint to the east of the cairns (take care on this flank!). Ill Bell can only really be approached along the ridge, either from Yoke in the south or Froswick in the north. The standard way onto the ridge in the south is via the Garburn Pass, linking Kentmere to Troutbeck, At the top of the path a pass branches off, heading up Yoke before reaching Ill Bell. To the north the ridge can either be joined from Thornthwaite Crag or High Street, or more directly from Troutbeck via a path that climbs diagonally up the ridge, running alongside the lower reaches of Hagg Gill before reaching the ridge between Froswick and Thornthwaite Crag (leave the path when it passes the lowest point between the two fells, cut across the gentle slopes to reach the ridge then turn right to reach Froswick and then Ill Bell. 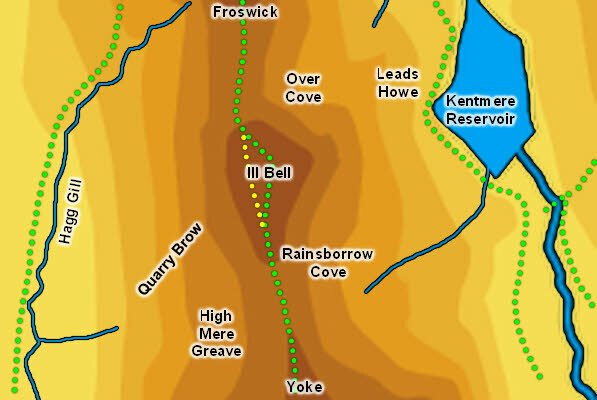 Ill Bell is often climbed as part of the lengthy but worthwhile Kentmere Round. Although the final 200 feet of the fell form a neat pyramid, the summit itself is slightly flatter than one might expect. The summit is topped with a number of tall cairns. Be aware that the ridge jinks to the west at the summit of Ill Bell, so it isn't safe to head north - instead follow the path that runs north-west from the summit then continues north towards Froswick. The western border of Ill Bell is Hagg Gill, which rises on nearby Froswick and then flows south-west and south to run past Ill Bell. A nameless beck forms the south-western boundary, flowing west from the ridge between Ill Bell and Yoke. On the Kentmere side a nameless beck forms the south-eastern boundary, flowing from Rainsborrow Cove into the Kentmere Reservoir and another nameless beck is the north-eastern boundary, flowing from Over Cove north-east into the River Kent. Ill Bell thus has a small footing on the River Kent. The western shore of Kentmere Reservoir belongs to Ill Bell. There are quite a few examples of fells with identical names in the Lakes (there are two Harter Fells and two Red Pikes), but very few are as close together as the two Ill Bells. The second Ill Bell can be reached by heading north along the ridge from this Ill Bell and then curving around the head of Kentmere. Their summits are only just over a mile and a half apart, and the second one is thus always known as Mardale Ill Bell.